As the fall-out from the UK BREXIT vote trundles along a pace, a far reaching consequence has been the upturn in requests from the UK for information about acquiring Irish citizenship, the ultimate aim being to obtain an Irish passport. Presently, there are several routes to gaining Irish citizenship, one of which is citizenship through descent from Irish grandparents – if one of your grandparents is an Irish citizen who was born in Ireland, but neither you, nor your parents were born here, you may become an Irish citizen. Some time ago I received one of the first of such enquiries – a client whose grandfather was thought to have been born in Birr, Co. Offaly in the early 1890s. After the usual family details had been ascertained, a comprehensive search for the grandfather’s civil birth certificate or evidence of baptism was made, with no result. A marriage record (for the great-grandparents) confirmed her ancestors were indeed from Birr. A follow up search on the Irish Family History Foundation database of Church baptism records (rootsireland.ie) identified two of the grandfather’s siblings, opening up the way to identifying the family address (Moorepark Street, Birr) at the time of their respective baptisms. Now that an address had been identified, it was possible to carry out a place-name search in the 1901 and 1911 census returns, and as a result the mother and one child (i.e. the great-grandmother and granduncle) were identified. The 1901 census had returned just one result for the name provided for the grandfather; xxxxx a 15 year old resident in a ‘College and Boarding school’ in Tullamore, Co. Offaly. On further examination this ‘College and Boarding School Return’ was found to relate to the Reformatory School of St Conleth’s, Molesworth Street, Philipstown (now Daingean), in King’s County (now Co. Offaly). Although this child was several years older than that suggested by the client for her grandfather, this child nonetheless had the potential to be that person. However, lacking information as to home address, or parents’ names, no link could be established between him and our prospective Irish citizen. So, the documentary evidence was mounting up; a paper trail from the client back to her Irish great-grandmother, names and baptismal certificates for two of her grandfather’s siblings and a marriage record for her great-grandparents, but still no documentary evidence for her Irish grandfather’s existence, let alone a birth or baptism record for him. To be absent from one census is common, but to have been known to be resident in Ireland for the period covered by both censuses and to be absent from both, is less so. With this statistical probability in mind, the 1901 census return for the 15 year old resident of Philipstown Reformatory was revisited. 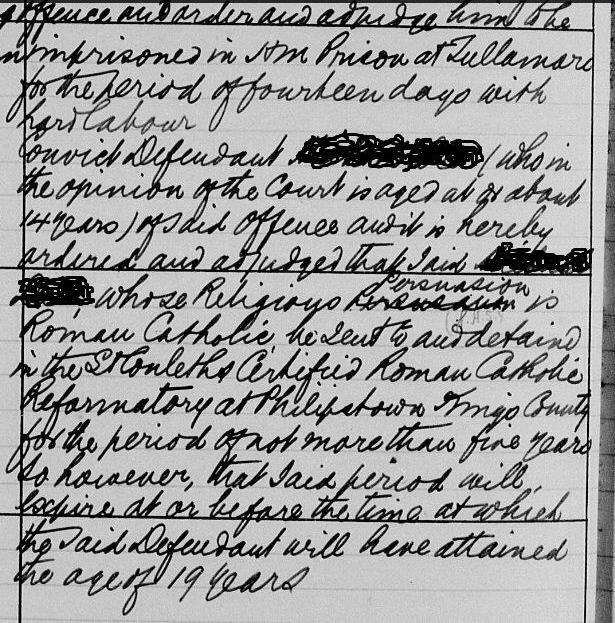 Children were sent to the reformatory usually at the behest of the courts, so the obvious place to continue the search was the Ireland, Petty Sessions Court Registers 1828-1912 (www.findmypast.ie) where four entries for xxxxx, King’s County were identified, all in 1899. With others, xxxxx was accused of stealing oranges and confectionary and causing damage with intent to steal, plants or vegetables. On three of the four accounts, the boy’s address was at Mill Lane, Birr, and on the fourth at Moorepark Street, Birr, the same address as his two co-defendants and the same address as on the baptismal record for the grandfather’s two siblings. While the boy’s co-accused were both sent to prison for terms of 3 months and two weeks respectively with ‘hard labour’, our subject was sent to the reformatory in Philipstown by the following decree…. ‘Convict defendant xxxxx (who in the opinion of the Court is aged at or about 14 years) of said offence and it is hereby ordered and adjudged that said xxxxx, whose religious persuasion is Roman Catholic, be sent to and detained in the St. Conleth’s Certified Roman Catholic Reformatory at Philipstown, King’s County for the period of not more than five years so however, that said period will expire at or before the time at which the said Defendant will have attained the age of 19 years’. Here it was at last, documentary evidence for the existence of the grandfather in his home town of Birr, Co. Offaly, and almost indisputable evidence confirming him as the 15 year old resident of Philipstown Reformatory at the turn of the century. So, while the application for citizenship has been made but has yet to be adjudicated upon, it could well be that the age old teenage pastime of being out with your mates, nicking oranges and sweets and generally causing headaches for local retailers may yet well provide the crucial evidence needed over 100 years later to allow the then unborn grandchild to become an Irish citizen. Anyone who uses these most useful of records, the Ireland, Petty Sessions Court Registers 1828-1912, and the Irish Prison Registers 1790-1924, knows what a valuable source of genealogical, and other, information they can be. The originals of both records sets are available in the National Archives of Ireland, Bishop Street, Dublin.